The hosts were hoping to be in the mix for the playoff spots but they are now officially out of the running, which means that there is only pride at stake at this game. Kaunas will want to ensure that their fans get a good send off in their final home game of the Euroleague season while Milan will just be looking to get the season over and done with. The hosts have a 7-21 record heading into this game while the Italians have a 7-21 record and have lost their most recent seven games in a row. This is the Italians final away game of the season and they will be pleased to get it over and done with. 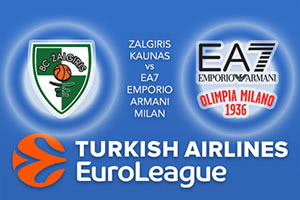 When these teams met earlier on in the campaign, it was Kaunas who grabbed the win in Milan by a score of 70-78. Arturas Milaknis was a key player in that game and his grabbing four of his six three point shots had a big impact on the final score of the game. Kaunas have been backed strongly so far this season with a couple of big consistent players including Paulius Jankunas, who has provided an average of 13.1 points per game while Brock Motum has notched an average of 10.7 points per game. If these players hit top form, you can expect the hosts to enjoy a good night. It has been an injury-hit season for the Italians with Ricky Hickman being the key player having grabbed an average of 10 points per game. There isn’t really any pressure on Milan in this game so they may be able to play with a bit more confidence but they have toiled on the road and this may be another difficult evening. Both sides have struggled this season but the hosts look much better placed to take this game and you can back Zalgiris Kaunas at -9.5 at odds of 1.90 for this Friday night Euroleague clash. The Over/Under market should be backed by going UNDER 160.0 at odds of 1.90. Bet Now!